Thomas Monteath (1788 – 1868) was an army officer in the Bengal Infantry. Born in Jamaica to a Scottish father and English mother, he rose progressively through the ranks, becoming increasingly senior as he distinguished himself in campaigns in India: cadet, ensign, lieutenant, captain, major, then lieutenant–colonel, brigadier and finally major–general. In 1865 he was awarded the KCB for long service to the Empire. In 1850 he inherited the fortune of his cousins Archibald and James Monteath (whose mausoleum now stands in the Glasgow Necropolis) together with the estate of Douglas Support (Lanarkshire), which came to his paternal grandmother Jean Douglas’s family through a labyrinthine series of wills and inheritances from the Douglas of Mains family line. He appended the Douglas name to his own in 1851. In 1826 he married a widow, Lucinda Florence Boleau in Meerut, India. She died in 1837. Their eldest daughter Amelia Monteath Douglas married Sir William Scott of Ancrum in 1861 and died in 1890. The last known descendant of Monteath Douglas died in Ancrum in the 1960’s. 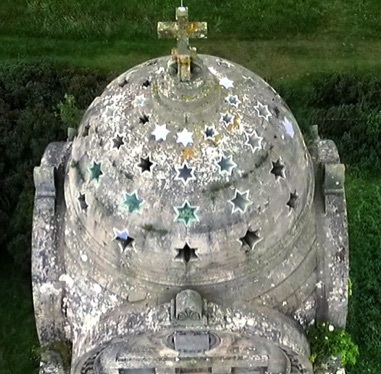 In 1864, Thomas Monteath Douglas commissioned the architects Peddie and Kinnear to design his mausoleum on an imposing site at Gersit Law, overlooking the lands of his son-in-law, where the battle of Ancrum Moor had taken place during Henry VIII’s ‘rough wooing’ in 1545. Monteath Douglas died in 1868, and came to rest here, having secured for himself a solitary and commanding position over the surrounding landscape for future generations to look upon with awe. Soon to be restored, the domed roof is pierced by 48 glass stars, casting a soft green light into the interior star chamber.